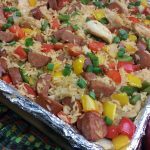 A heavenly jumble of smoky sausage, chicken, bell peppers and rice. Line a very large sheet pan with foil. Remove the stem and seeds and chop the bell peppers into small pieces. Slice the sausage into rounds. Slice your chicken in half to make thinner and then slice into small chunks. Place the peppers, onion, chicken and sausage on a large sheet pan. Toss with 2 tablespoons olive oil, and 1/2 teaspoon creole seasoning. Toss and bake for 12 minutes. Take the sheet pan from the oven and add in the tomatoes. Cook for another 6-8 minutes. Remove from the oven and add the rice. Toss and then place back in the oven for 2 more minutes. Sprinkle with fresh green onions.